This issue of Weekly Shonen Jump actually ran a special one-shot for JoJo’s Bizarre Adventure but I have yet to see it online. As promised this time round, the review is much more detailed. Did Beelzebub really go there It might some people off but I liked that the series went there. The flashback was a lot more serious than I thought it was going to be, so it was only fitting for Beelzebub to follow through and end this arc on a more serious arc. The sensitivity of all this was definitely unexpected but it didn’t come out of the blue after what happened in the previous chapter. Before I get to how heart-warming the chapter was, I’d like to praise the author for bringing up such an important point regarding Furuichi: he is a strong character. Though I’ve never even thought to ponder why Oga and Furuichi hang out, I’m glad that I found out but more than that, I’m glad the reason is mature and humanizing instead of being another joke of a reason that Beelzebub seems to love. Furuichi always gets the short end of the stick but unlike all those who fell in the face of Oga, he never does anything but speak his mind and act out against Oga. Furuichi being made into a mentally strong character just shows us that Beelzebub isn’t all fun and games but occasionally a deep manga with more to offer. What better way to end this touching chapter than with the entire fighting cast appearing for Furuichi’s sake, thus giving this arc an unexpected ending after weeks of pure unadulterated fun and games. The arc as a whole was one of my favourites, if not the favourite, in Beelzebub. Furuichi’s involvement is most definitely a factor and because we don’t get to see a lot of him in more serious situations, it further propelled my enjoyment of the arc. I’m sad but I understand that we must move onto the main story. If this chapter concluded things, I would not have been impressed. Luckily the series is venturing into quite interesting waters with plenty of exploration time left. The first time Koro-sensei is truly helpless is now, when his students got screwed over by the test. A continuous attempt to remind us that he is an educator first and an alien second, but one which carries a lot of weight considering he didn’t come out on top on his first try. Every time we have seen Koro-sensei he has managed to escape assassinations like they were nothing, fix his students’ behaviour with no difficulty and do it all whilst performing stupid acts. The likelihood that this arc lasts a while is quite low, though that’s not surprising. Given the style of the manga we haven’t reached a point where a more continuous arc can be tried out so for now we only get the short arcs, which isn’t bad at all because it keeps the story from getting dull. The new antagonist is on a new level and it’s going to be interesting to see how he is dealt with and if he’ll be a long-term antagonist or if he’ll jump on the Koro-sensei bandwagon soon enough. I’m liking the arc and I want to see it last a little longer. As usual, Reborn! coasts by without any big plot twists or surprises. It’s only at the end that there is any type of plot twist. Bermuda’s defeat had that signature amount of lacklustre entertainment that Reborn! is so famous for and the subsequent confrontation played out exactly as one could imagine it playing out. A little obvious to have Bermuda interrupt Tsuna’s conversation with Checker Face’s subordinate, kind of like a man justifying his life on his deathbed, which was uneventful until Checker Face actually revealed himself. Kawahira is a character we know practically nothing about, so him Checker Face has it’s advantages and disadvantages. For one the mystery of the Tre ne Sette is enhanced by involving a character shrouded in his own mytsery, not to mention his involvement will have to be explained but then again it is hard to see an outsider as a viable candidate for main antagonist, This definitely puts a damper on Reborn! wrapping things up in the near future, and if they do there is a good chance quite a few questions will go unanswered. Now I assume Kawahira will have his story explained in the next chapter and then we’ll either get more action or a little bit of actual story progression. Personally, I find it hard to predict what will happen after learning the most recent development, which can be seen as a good sign considering how predictable Bermuda’s demise ended up being. Let’s wait and see. My initial disdain towards this flashback arc has started to disappear but only at the end of this chapter. I’m still not on board with how things are turning out with the story, but looking for a bright side to all of this isn’t as hard as I would have imagined. That still didn’t stop most of the chapter being run-of-the-mill and uninspiring but at least the ending when we saw Kakashi with his hand in Rin, there was sadness and emotion which was executed well. 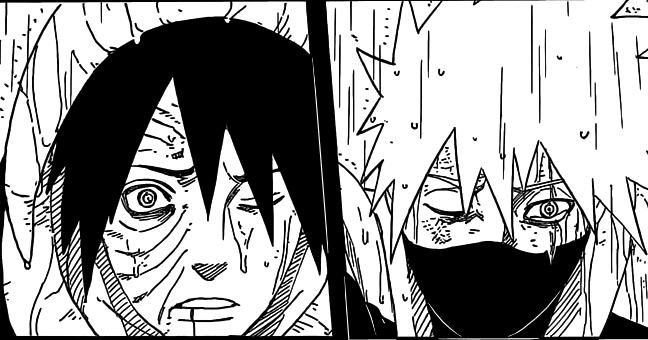 In many ways Obito and Kakashi’s relationship is a ‘what if’ of Naruto and Sasuke’s. 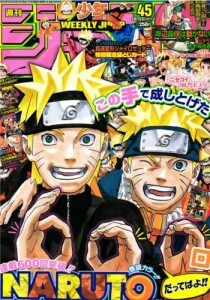 Looking past the obvious, Naruto has always used fate as one of it’s core themes so by having chapters such as this one. As a recurring theme, this chapter did it justice and what’s more it reminded us about how the little things and decisions can make a character turn out so differently. This all very shonen-esque so if your not desensitized to it, you would probably hate it and I wouldn’t blame you for it. 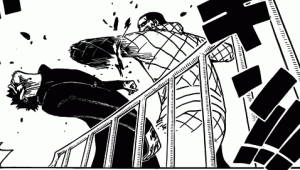 I still found this chapter a nice surprise, and possibly the saving grace of this flashback arc, since it triggered my interest to know more about what happened to Rin – I’ve long since lost that interest – and maybe get a better explanation from Obito for starting his crusade. We’re going somewhere that may involve an end in sight for this series. 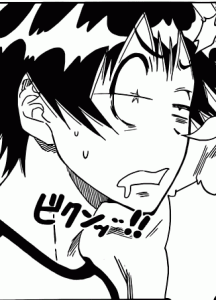 The fact that Raku fell asleep right before he was asked for a kiss by Onodera was half-expected since this type of confession doesn’t really sit well in the long run. I may be biased because we got to see some more adorable Onodera. The biggest surprise was Chitoge’s reaction to Raku’s insensitivity that makes me think the end is closer than we might think. I always pictured Nisekoi coming to it’s end when Raku has to choose between Chitoge and Onodera, and this recent outburst from Chitoge makes me think we are nearing that point. More and more each chapter, we see the focus coming narrowing to just show us Chitoge, Raku and Onodera. Who will be the chosen one Everyone has their preferences, but I think it’s pretty obvious which girl Raku will end up with (even though it pains me to admit it). It feels like the right time for Nisekoi to consider ending (not too quickly though, like 50 chapters), and I truly believe that this series isn’t suited for a very long run. The end came abruptly, with a rather strange development. Yamamoto’s imminent loss is as hard to swallow after this chapter as it was the previous chapter, proving that waiting for something doesn’t make it any easier to watch/read when the time arrives. 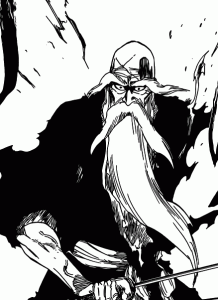 A little disappointing that he wasn’t fighting Juha Bach this time, but the plus side is that Bach is really the final boss whom Yamamoto couldn’t even scratch. The most disappointing part of this chapter was when Bach mentioned his intention to free Aizen. A part of me rolled my eyes and then pouted in annoyance over that particular cockroach’s inability to die and also at Kubo-sensei for as much as considering Aizen’s return to the series. Aizen was a great character but if he’s brought back, it will be for the popularity votes and not for the sake of the story. 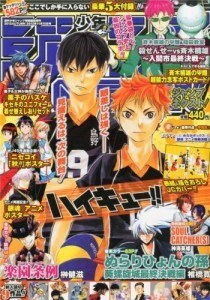 Next chapter there should be a more conclusive end to the arc. A little upsetting though, since I’m guessing Ichigo will make re-entry some time soon but then again there are a few more mysteries surrounding Bleach currently and focusing on those could be entertaining. I’m going to miss Yamamoto. I’m beginning to see less value in this arc now that it has been dragged out for so long. Luffy getting himself into a Star Wars IV trap just didn’t make me laugh or evoke any other emotion if I’m being honest. 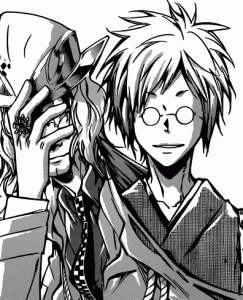 Snoozing away with this chapter, I only got woken up when we got to the part involving Law and Vergo came into focus. Law got made a fool out of Vergo pretty badly, a development that doesn’t actually last long but instead sets us up for the Smoker v Vergo confrontation that feels oh so natural. That’s all I got! One Piece has been too uneventful this chapter to register in my memories.